At dawn on 2nd May 1536, Sir Henry Norris, Henry VIII’s Groom of the Stool and great friend, was taken to the Tower of London. Mark Smeaton had also been taken there, and the imperial ambassador, Eustace Chapuys, wrote to Charles V on 2nd May telling him that George Boleyn, Lord Rochford, was also in the Tower. 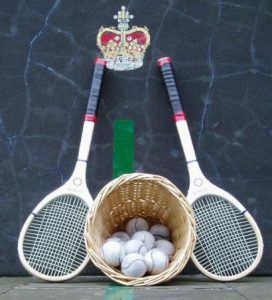 Anne Boleyn was watching a game of real tennis when she was disturbed by a messenger telling her that the King had ordered her to present herself to his privy council. Anne left the tennis match and presented herself in the council chamber in front of a royal commission consisting of the Duke of Norfolk (her uncle), Sir William Fitzwilliam and Sir William Paulet. There she was informed that she was being accused of committing adultery with three different men and that Smeaton and Norris had confessed. Anne was then taken to her apartments until the tide of the Thames turned and then, at two o’clock in the afternoon, she was escorted by barge to the Tower of London. We can only imagine how she felt as she travelled down the river to the Tower, just as she had done three years ago for her coronation festivities. Hi Claire. These were dark days indeed; the beginning of the end really. I try and put myself in Anne’s position, as a person, not as a historical character. It matters little that times were vastly different from our own in that most people were aware of the ‘justice’ system in place in those days. They knew the punishment for crimes often resulted in death in its various guises, and even the petty criminal knew what penalties they could face if caught. I believe that Anne’s first reaction to the accusations against her would have been of sheer disbelief and horror. Her mind must have been whirling and she must have been thinking just how this could have happened and what could she do about it. The whole scenario of being called to the royal commission to hear the accusations would have been a waking nightmare especially with uncle Norfolk sitting in front of her. Imagine having one of your own family members telling you this dreadful news. She must have thought ‘why are you doing this to me?’ and as the Duke was one of the most powerful men in the land the seriousness of her situation would have hit her like a blow. To imagine what she was going through on that journey toward the Tower then I would liken her to the Wyatt poem ‘Whoso List to Hunt’. The ‘hind’ would indeed be fearful for her life, eyes moving from side to side, heart sinking, faster, faster until brought down finally to die. The day is fast approaching, yet I feel that Anne, if she still exists somewhere, had known there would one day be so many of us who would fight her corner, then she could have taken some small comfort. I wonder? if we were there, and if we were strong enough, could we have stopped the horror and made a difference? I am just writing this at 2pm U.K. time, as Anne’s final journey began. It is spine chilling to put yourself in her shoes. As Alison says above she must have known deep down what the outcome of these events would lead to, but the initial shock must have felt surreal. As she sat in the barge with the tower looming in front of her, it must have deemed near impossible that this was happening to her, a Queen, the woman Henry had virtually moved heaven and earth to make her so. When ever these events are reached on here, or what ever book I am reading I always get that churning in my stomach, you know the one I mean, when you are worried or scared about something, silly isn’t it…but really we can only guess the terror that was going through her mind, oh the poor, poor, innocent Lady. I know what you mean, I feel it, too. It breaks my heart, it gives me chills, evey day in May I think about Anne and I can imagine how she felt. …These Bloody Days have broken my heart… for sure, Circa Regna Tonat! 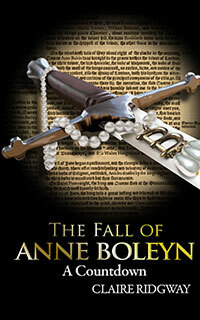 I have started to re-view Anne of the Thousand Days and the Tudor. Re-living each moment with Anne in her last journey. it has taken just as many to discover the truth. Innocent of the charges brought against them all, a prejudiced jury, and a King set to see their destruction. None of them had a chance for survival or redemption. …There did I learn out of a grate/For all favour, glory, or might,/That yet circa Regna tonat. The winners re-wrote their history, and the centuries covered their memories in lies and infamy; both ill deserved, no matter their defense. grate of his cell in the Bell Tower at the Tower of London. Here is the link to the full poem. Thank you, Claire, for helping to make these events so real for all of us. I have purchased your book at Amazon, and anxiously await its arrival. Do any of you think Henry really believed that Anne was an adulterer and that is why he had her killed? I am trying to remember if we know for a fact that Henry knew that the allegations and evidence were fabricated… Then once Anne was dead, do you think Henry ever regretted or questioned his decision, even years afterwords? Yes, and I had to think about this for a little while (dangerous for me), I do. I think in the later years of his reign, and when Anne of Cleaves and Katherine Parr (to of whom Elizabeth became under the guardianship of Katherine and Thomas Seymour) brought his children to court that he actually, especially after Catherine Howard, looking at his three chidren from three different wifes he did in private moments when he was getting older and in so much pain that he most certainly did. He knew that Mary was worshipping Roman Catholicism behind his back, and Edward, his male heir he so desparately wanted, but who was about a strong as his older brother Arthur in his bodily woes (there is some contraversy to this and that Edward was poisoned and others, of which I don’t believe as small pox was enough to finish off a person who was by all counts what I have described), and then his permanently bastardized Elizabeth, who was the most intelligent, more learned, the most Protestant in faith along with his very Tudor very brilliant red hair with her mother’s dark eyes that said so much, yes. The marriage to Anne took years and for the “Defender of the Faith” title in 1520 bestowed upon him, and later broke from Rome to marry Queen Anne, and went the ways of the Prostestant countries to support him and he becoming allied with the Prostestant countries of Europe (after all he the marriage and annulment of his marriage to Anne of Cleves of Germany [very Protestant -after all it was Martin Luther who formally began the Reformation on All Saint’s Eve, on 31 October 1517 by his nailing of his 95 “Treastises of Indulgences” (more commonly known as the “95 Theses” after Johann Tetzel began the sale of them came to Wittenburg, and thereby….so on as the rest is history, but Germany being the strongest ally, and Switzerland as well as others. He could not legitimize Elizabeht as before Queen Anne’s exectuion the marriage was annulled and she was executed for her cheating on him (and other charges as well), and in later years Queen Elizabeth I never tried to legitimizae herself as she said it was through her father and the “Act of Succession” she was an annointed Queen. In short, yes, because Henry (and hindsight being 20/20) he must have thought that if he could have waited a little longer through one more preganancy, perhaps he would have had the mail heir he so richly desired, with the Boleyn traits – longevity, intelligence, royal blood (Queen Anne was of direct descent from Edward I in her own right), must have looked back on his marriage to Queen Anne with the love that first got him in the first place, and must have guilty about the lies involved, her brother, and so on, and that Cromwell (who paid for other things as he was executed in 1541-42), outdid himself in the conviction of his wife and mother of his most capable child (children like that sitck out to their fathers), that YES he MUST have regretted and questioned his decision. To tell you the truth I am suprised his ego and vanity allowed these charges to be used, making him a fool and a cuckold…but I suppose he was convinced by his hencemen, and himself at the time that it was the way to go, and of course by now he wanted Jane, so whats a few ‘fibs’ if it gets you a result, no matter what the cost…something that became more prevalent in Henry’s court as time past by. But left alone with his private thoughts… Yes, I defo think he knew the truth. you heard this.If so it proves Cromwell had to get as much dirt as he could. Whatever Henry’s believed, his actions on Queen Anne changed him forever. And as we all know not in a good way. Elizabeth health, intelligence, wit and eyes were a reminder of his one true love. That question crosses my mind every single day- did he really belive all charges against her were true?? I watched same interview with Hilary Mantel last week and she said something like- ,, at some point before his death Henry said I thougt she comitted adultery with a hundred man??!! Do you know if there is any evidence that he really siad that?? And even Chapuys is sceptical of Henry’s claim, saying that the King does not seem bothered by being cuckolded/betrayed.